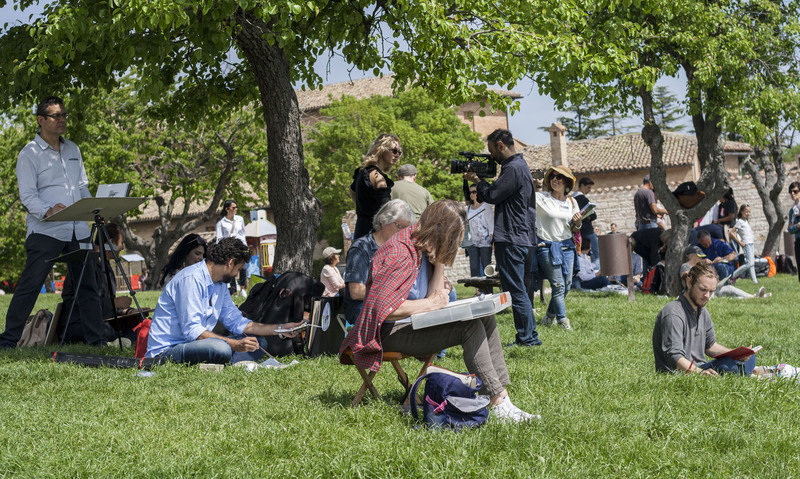 After the second International Watercolor Biennale in Pakistan, My husband and I got the opportunity to participate in the largest International Watercolor Festival held at Urbino and Fabriano, small towns in Italy, due to their rich art history and long commitment to the art since the Renaissance. The birthplace of Raphael, a quiet and peaceful hill-town, Urbino is a small sloping hillside area in Italy in the region of Le Marche whereas Fabriano is the Italian creative city, according to UNESCO, and famous in the world for its handmade paper production. 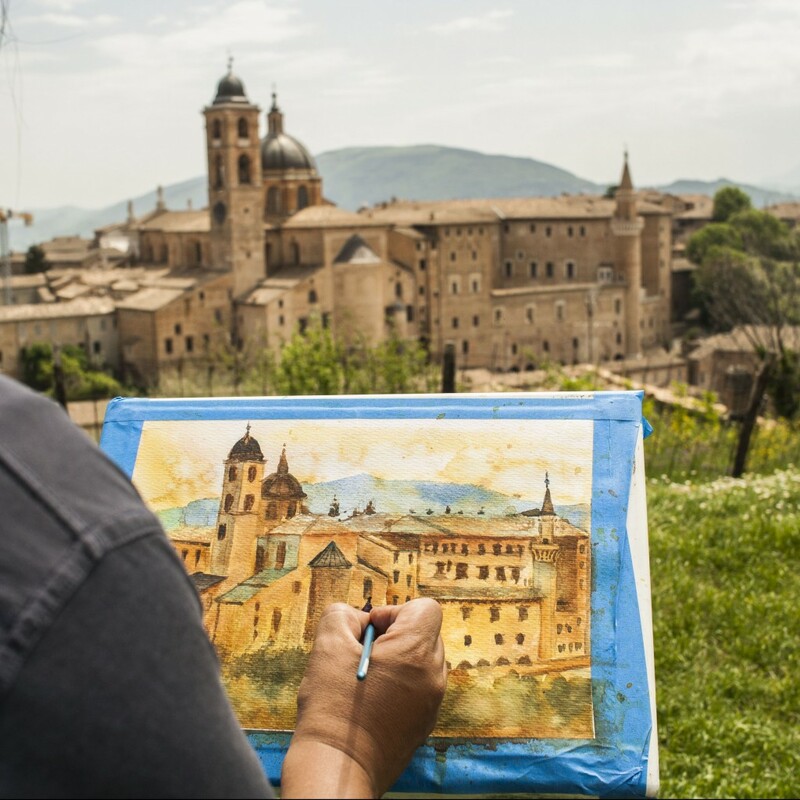 From architecture to parks to museums, each site of Urbino and Fabriano is blessed with extraordinary and striking views of renaissance culture and each corner speaks about the historical artistic importance. 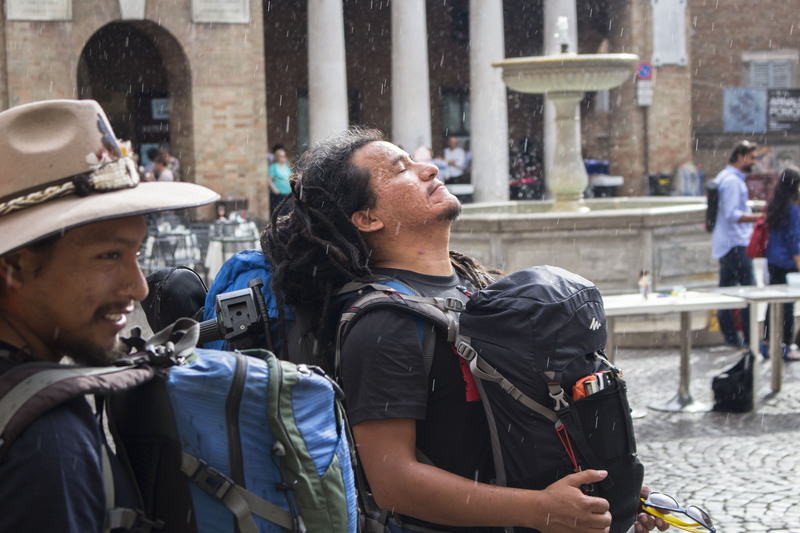 The event started at Urbino on the April 29th, 2018, where the calf muscles were challenged as a result of walking through hilly topography, but it was worth reaching Piazza Della Repubblica, a famous junction where all the streets meet. Cold breeze, mild rain and beautiful cloudy weather were the first things that added the “wow” factor in the event. 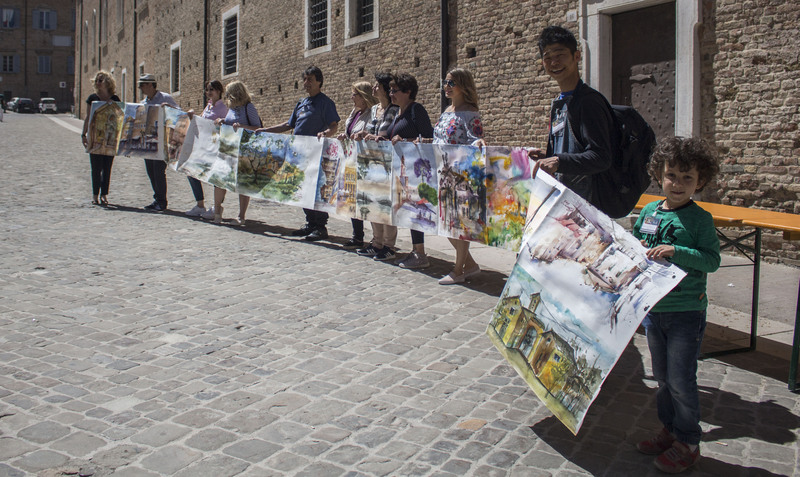 The Urbino Watercolor Festival was a delightful and refreshing experience as I got a chance to meet more than 500 artists from 35 countries. Meeting and communicating with the artists from different countries, speaking different languages was another exciting element in the tour, after the festival itself. 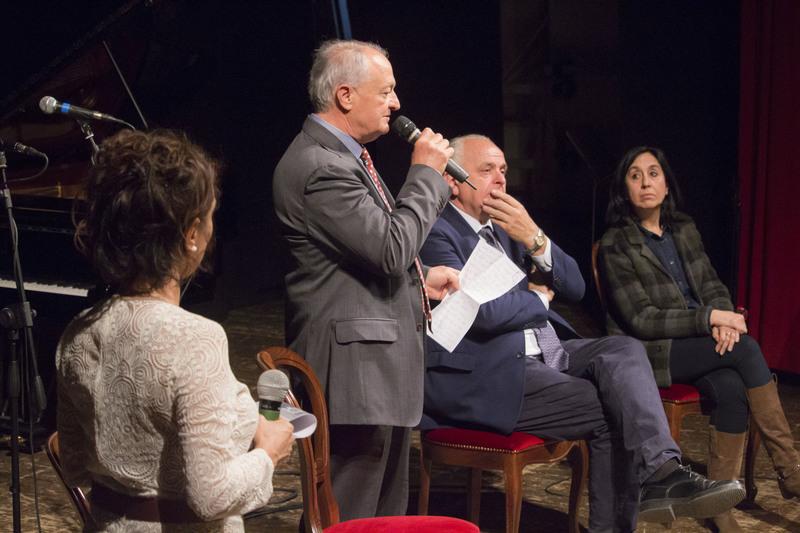 The energy of the event was wonderful with the host, Art Director, Professor at the Urbino University, Prof Soha Khalil and Robert Ruggeri, the President of UrbinoinAcquerello. 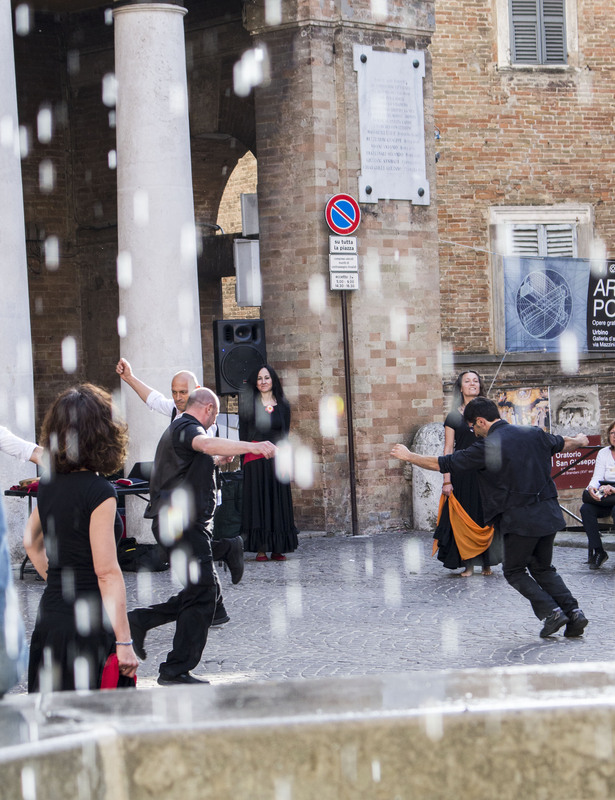 The well –organized event was a succession of art workshops, live demonstrations, performing arts, and local music, exhibitions and plein air at different venues of Urbino. 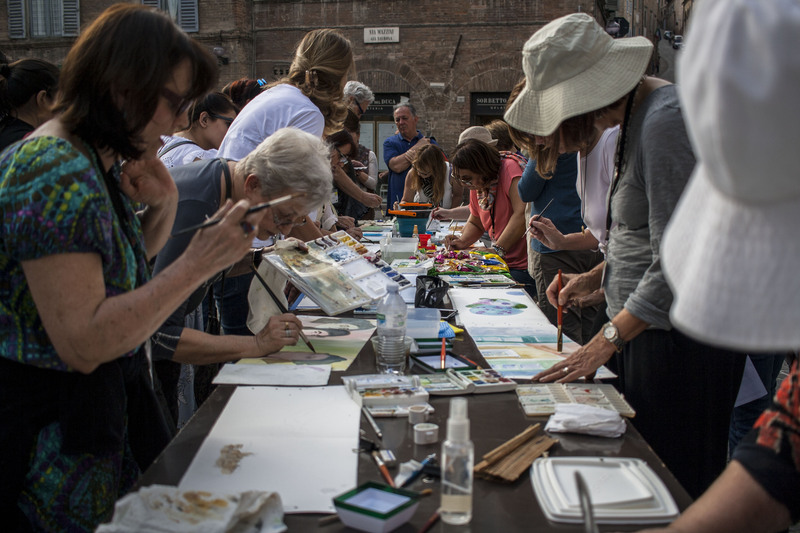 In Piazza Della Repubblica, every corner seemed to be a canvas where all the artists from around the world were blending into watercolor with different techniques to make it look more beautiful and artistic. 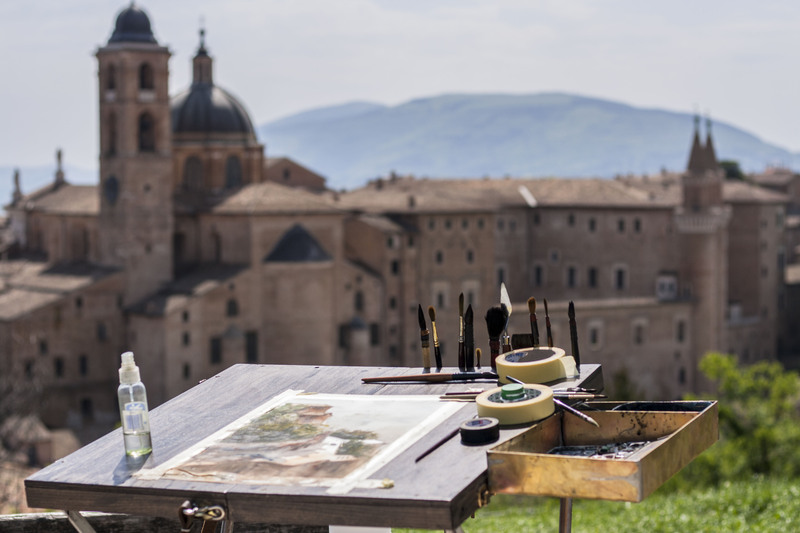 The artists observing the beauty of Italy, painting the historical building of Ducal Palace, sweet chants of the birds and church bells echoing the whole Urbino enchanted the atmosphere. This would mesmerize anyone who could imagine the moment. It felt like the heaven had come down on the earth where there is peace, art, nature and love in a blessed package gifted from God. 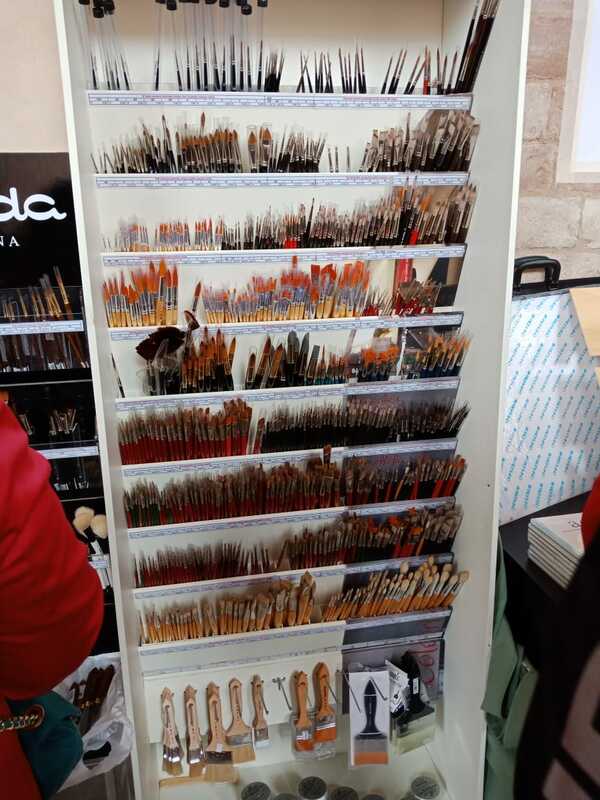 The festival was more like a family gathering and the city was transformed into an academy where there were senior artists who shared their deft and amazing techniques through demonstrations. 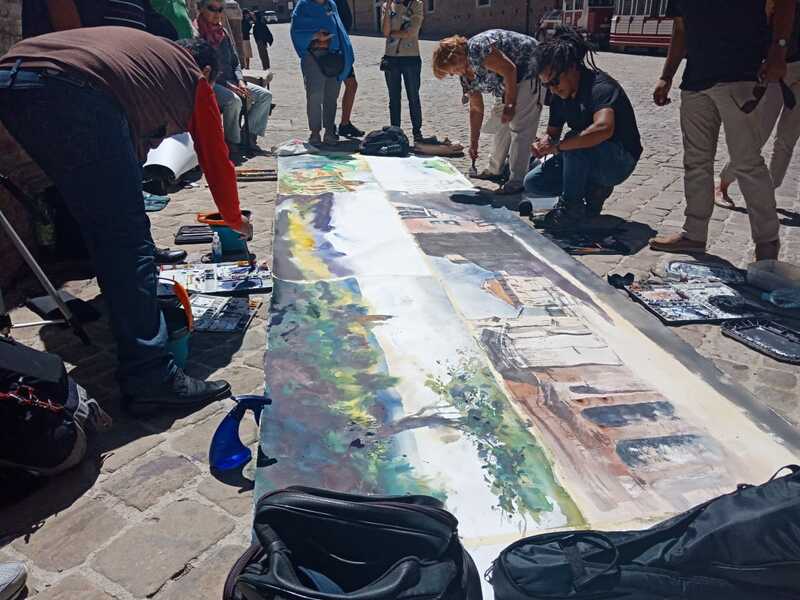 From Pakistan, Ghulam Nabi Qazi and Sharjil Baloch (the country representative for Italy watercolor festival) were offered by the Art Director to give live demonstrations in Urbino and again in Fabriano. Mr Qazi showcased one of his famous series of old architecture of Sindh with nimble strokes, whereas Mr Baloch, a spirited artist, painted a portrait which was worth celebrating. 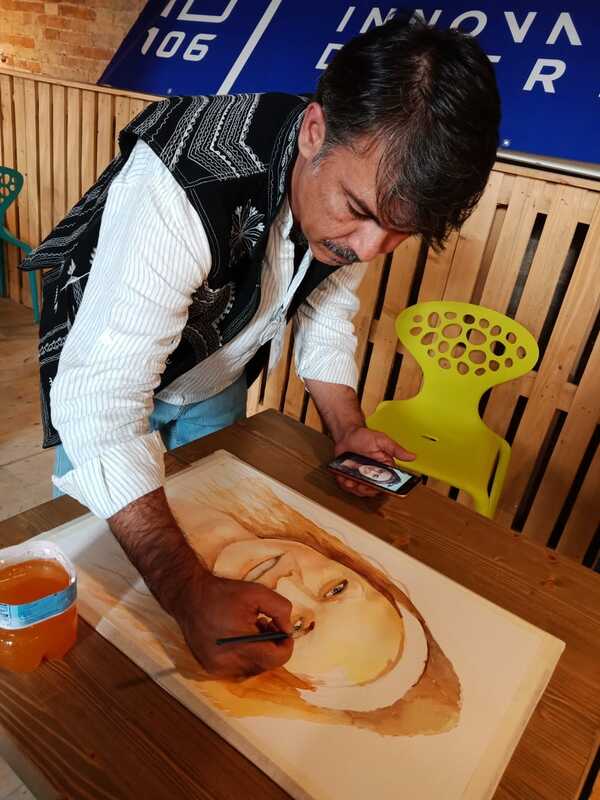 The country leader Mr Ali Abbas Syed, an eminent watercolor master, spread the magic of his watercolors through live demonstration which knocked everyone off their feet and held in high regards from the organizers to the participants. 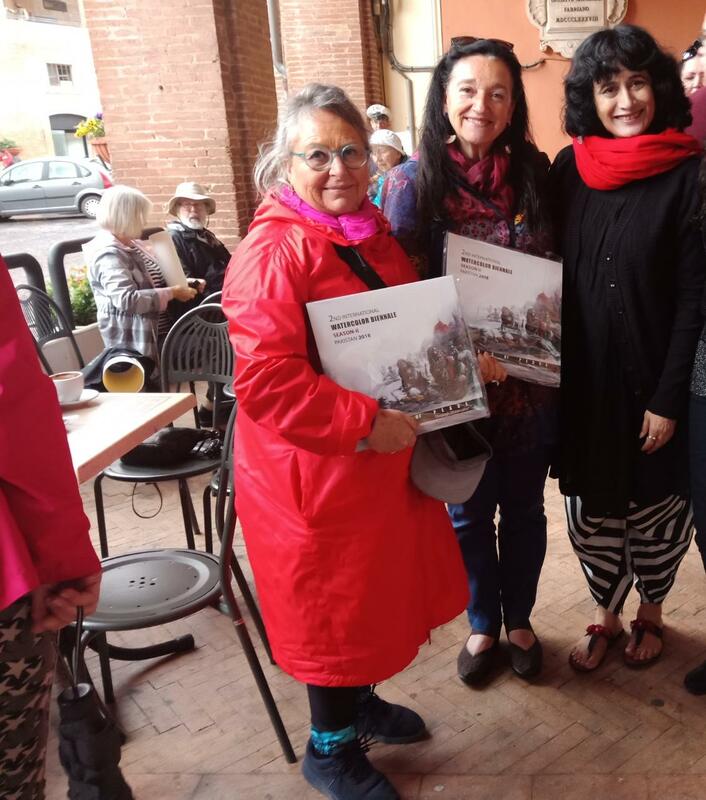 These demonstrations added stars to the festival and many Pakistani artists were honored to have their works displayed at the Fabriano museum. 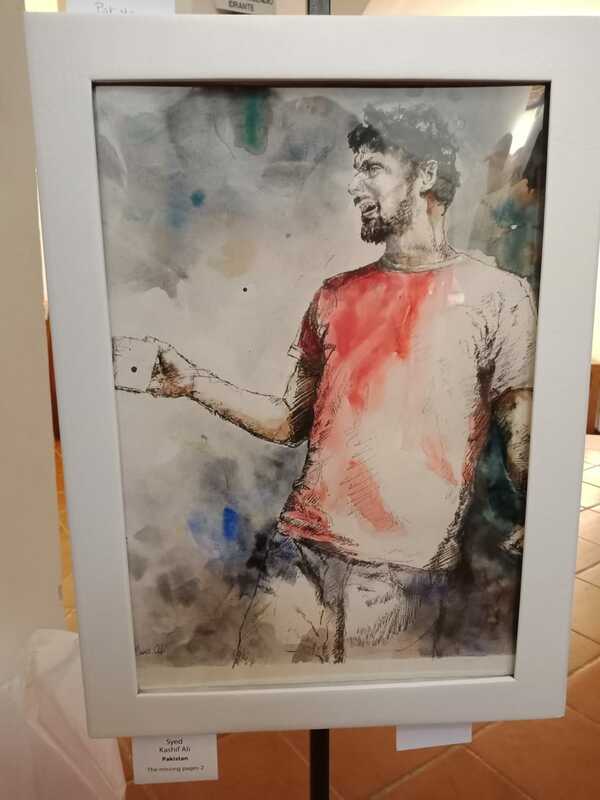 S A Noory, Shan Raza depicted the culture and beauty of the country using unique technique in watercolor whereas Syed Kashif Ali showcased the contemporary form of watercolor playing with the loud hues in his painting series “missing pages” which was also embellished on the walls of Fabriano museum. 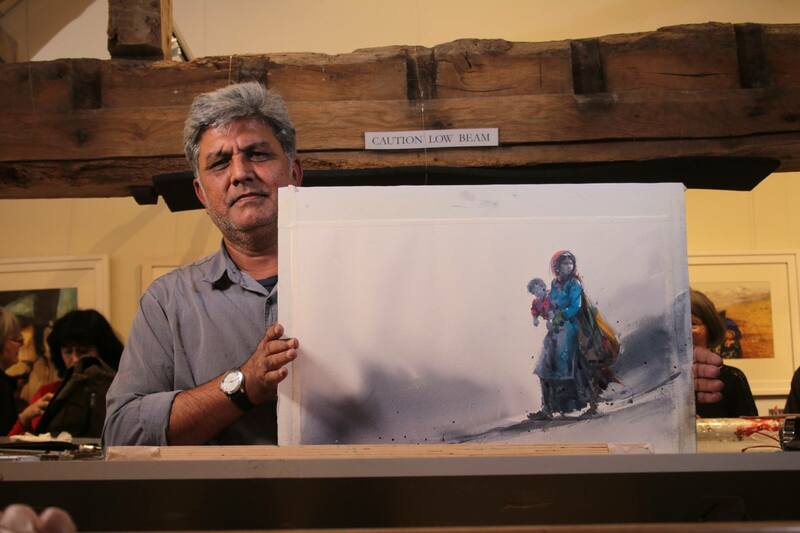 It was a proud and respectable moment for the country, when other artists from around the world recognized and appreciated Pakistan’s art and how brilliantly this medium is evolving through the watercolor magicians like Mr Syed. 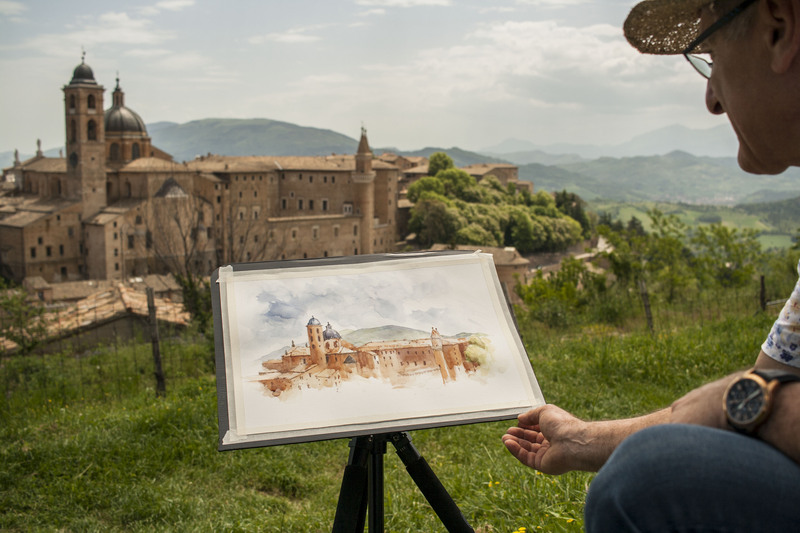 The festival created such a peaceful and artistic environment that felt like artists from all over the world had squeezed in Urbino where there is only art, love, friendships and encouragement. 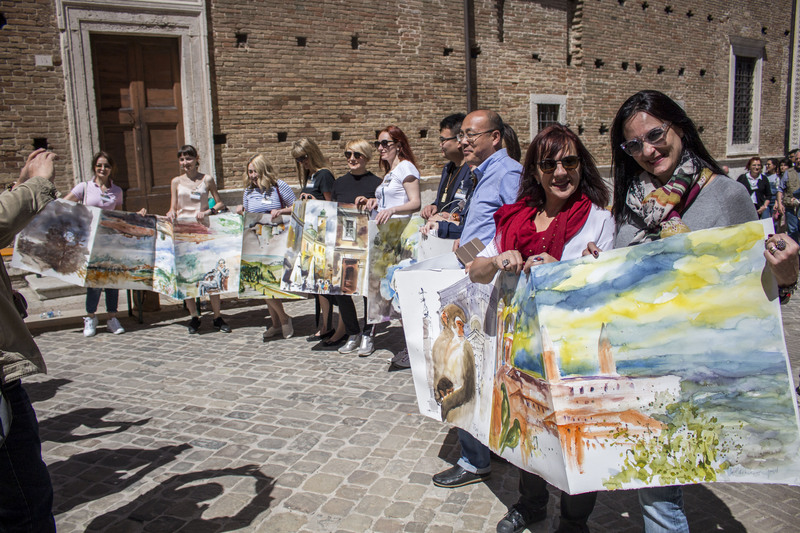 It was not limited to a hall or a museum, but the tourists and the participants had a chance to explore the historical places, museums, art galleries and theatres due to the arrangement of the plein air, demonstrations, performances and exhibitions at multiple historically important spots. 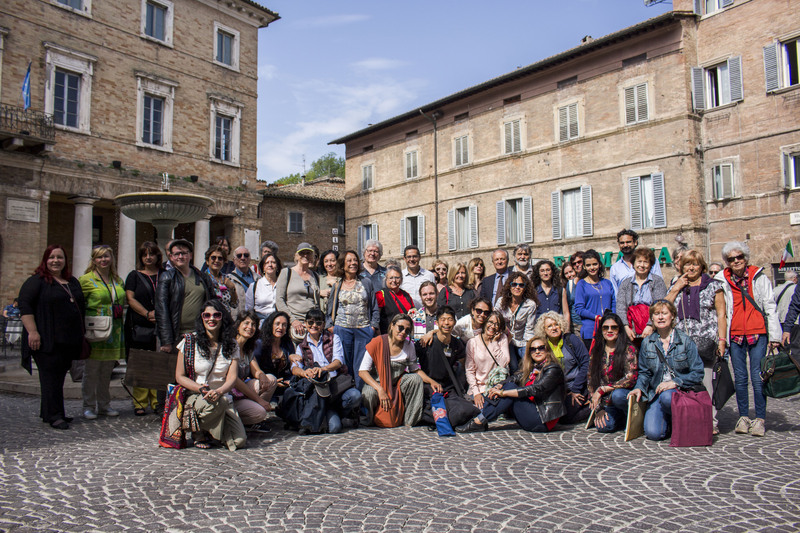 After 3 exciting days in Urbino, the next destination was Fabriano where Ms Anna Massinissa hosted us. 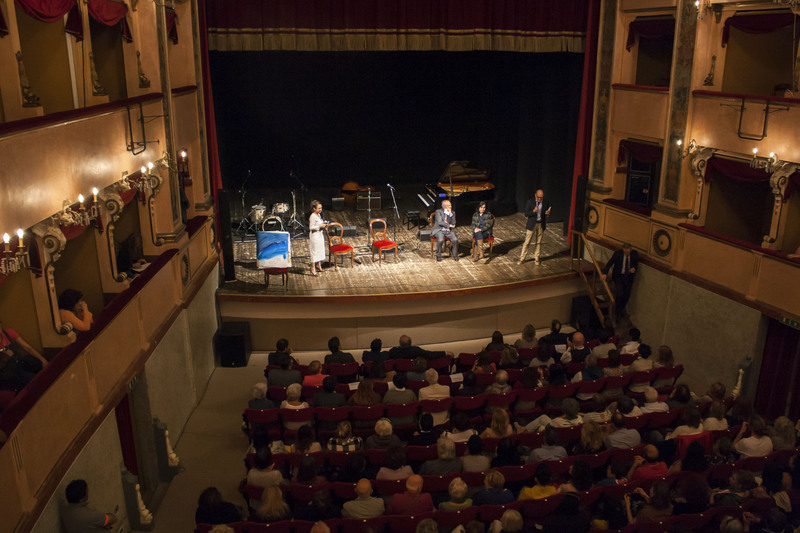 The mayor opened the Fabriano festival and translators were arranged to interpret the speech in different languages so nobody feels left out rather welcomed and equally valued. 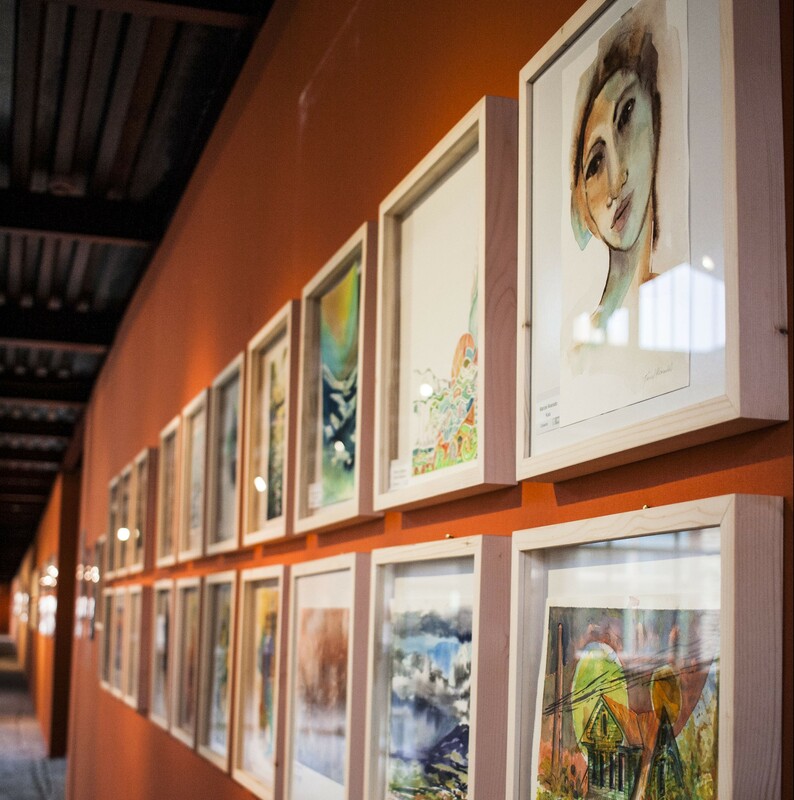 The famous Paper and Watermark museum at Fabriano was organized to display the art works of the artists where each country displayed watercolor paintings of between 10-15 artists which not only showcased the extreme talent and subjects, different styles and techniques but most importantly the strength and potential of the watercolor medium. One would have goose bumps entering the Paper and Watermark museum, which would tell you the history of paper making since 12th century on each step you, take. World famous papers are produced from that factory which also have a museum where they have maintained and preserved the first and the oldest high quality paper made on the industrial scale in Europe, the oldest currency produced from there and the oldest paper making machines to amuse the world and enhance the historical importance of the museum. We not only got a chance to look at the oldest paper made from Fabriano, but some had an opportunity to make their own paper which the demonstrator gifted as a memory. 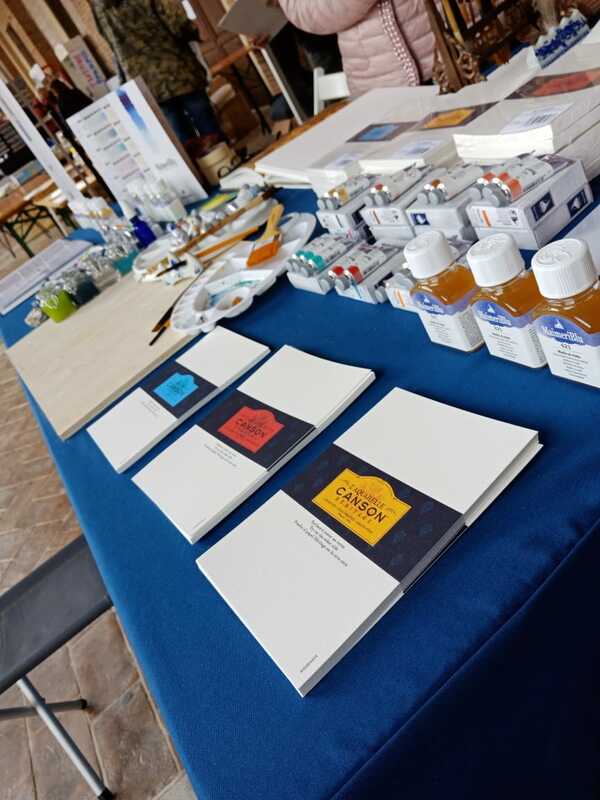 The organizers of Fabriano festival arranged kiosks with discounted prices on the paintbrushes, papers, all types of colors and paints and other important materials required in art works. 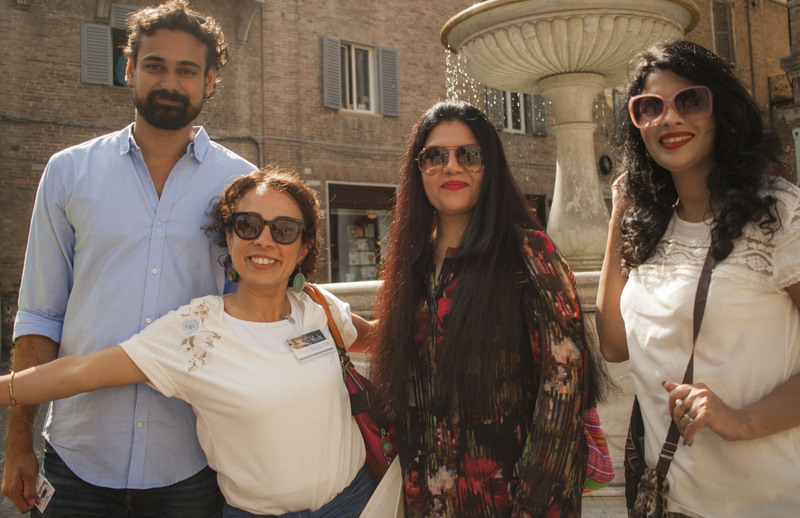 The award ceremony held at Fabriano, hosted by Mr and Mrs Ali Abbas Syed, was the cherry on top that boosted the enthusiasm and confidence of the artists. The artists whose work and determination was appreciated included, Anna Massinissa, who was awarded with the Queen’s award, Honorable award was given to Kauser Hussain, Rajat Subhra and Gabriele Koeings, Hardship award to Hanna and Jansen Chow, Best Junior award to Sergey Temerev, Appreciation award to Graciela Noemi, Excellence award to Pablo Ruben and Tejo Van Den, Best organizer for World Watercolor Workshop award to Isabel Moreno and Lifetime Achievement award to Teresa. Some artists like Nicolas Lopez, Jorge Corpuna from Peru, and Milosz Nosiadek from Poland gathered a lot of appreciation and love from the locals and international artists. They never waited to be called for a demonstration because they had their brushes and paint boxes with them and wherever they would see a beautiful view they would start painting. These two watercolor festivals were not just “art festivals” but an exchange of ideas, techniques, and a complete academy for all the young artists and the masters. 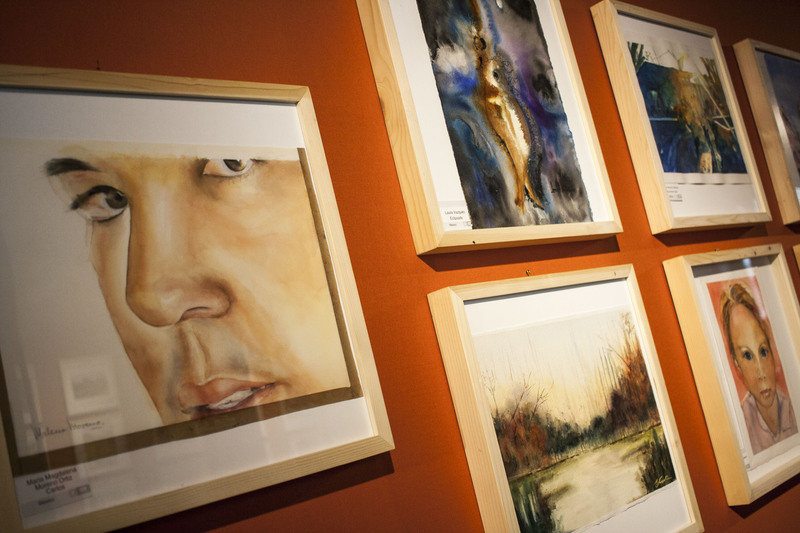 “I always wanted to gather the artists from around the world on a platform where they can exchange ideas, watercolor techniques and culture. 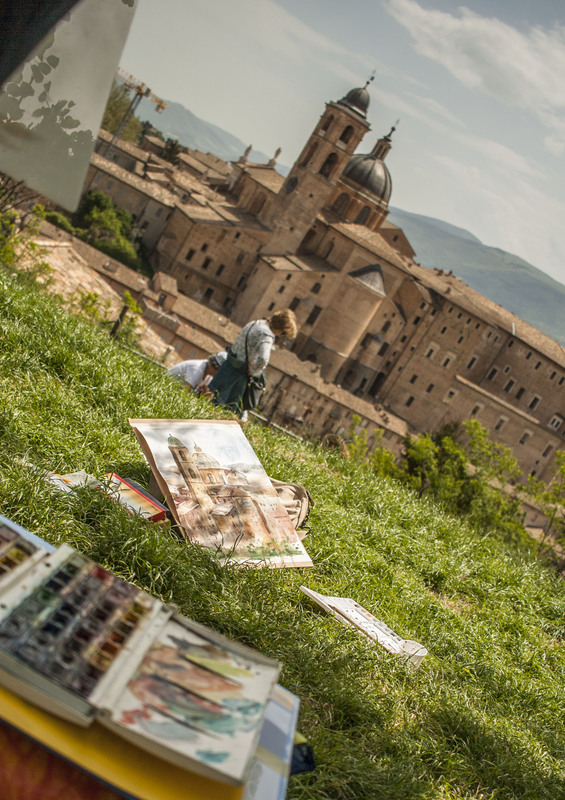 I still can’t believe that it has been three years since I’ve accomplished what I had dreamt of; making Urbino a point of cultural and artistic exchange. We all have become a family and to the artists who could not come, I miss them. 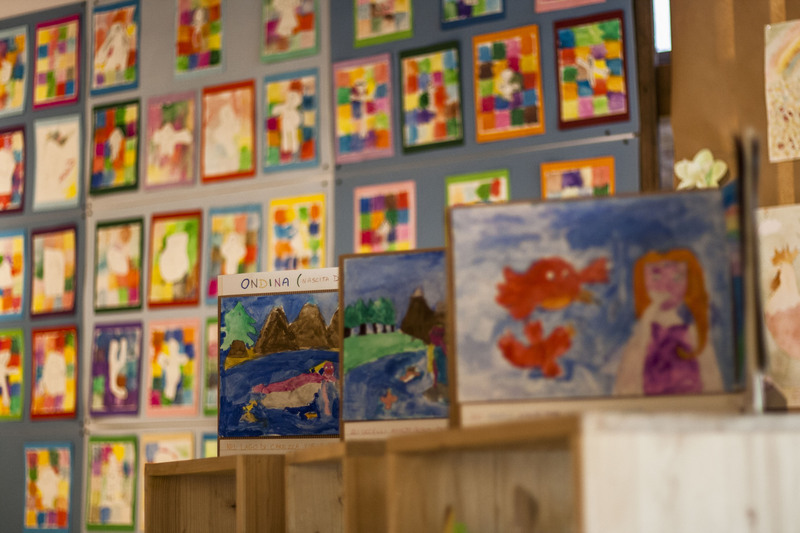 I warmly welcome all the artists to enjoy the festival”. I am at a loss for words when I try to explain the fun and joy I had being around such talented artists and getting to know the wonderful people of Italy. I was introduced to them for the first time but it never felt a formal meeting and when I was leaving Italy they hugged me like we had been friends for ages. It was an honor for me to attend and be a part of an international festival that had no political, religious and commercial objectives, but intended to promote art on an international level and to become a platform that plays a healthy role of brotherhood and peace between the countries. 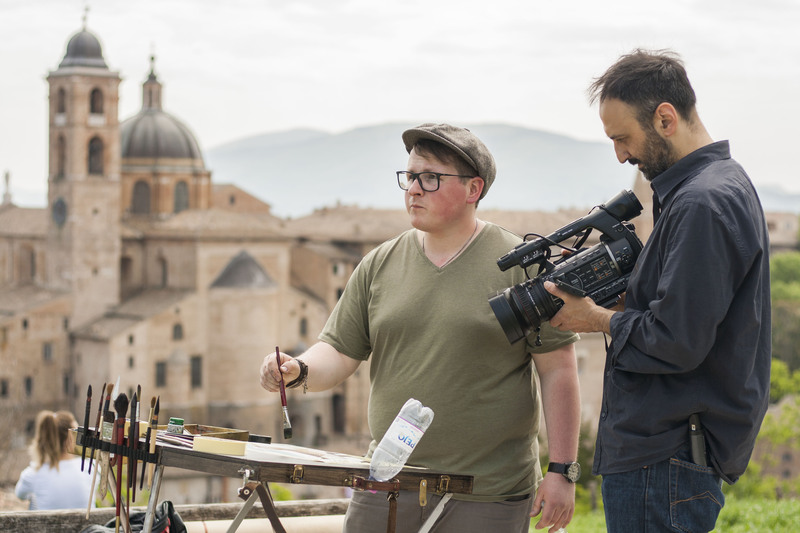 Being in Urbino and Fabriano was an exciting, knowledgeable as well as learning experience for me. The watercolor festivals in these cities were a great opportunity to explore the historical places and know more about art. The sweet moments of Italy and this experience worth a million dollars will always stay fresh in my memories.